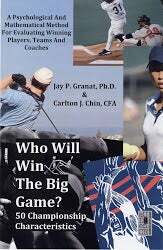 Over the years, Dr. Jay Granat, a psychotherapist, and I have studied championship factors related to sports psychology to predict the winners of major championships. Much of our research has focused on quantifying concepts such as consistency and minimizing errors. These factors are often overlooked by most sports fans and analysts. Our regular series of “Who Will WIn” quant facts predictions have been correct about 64% of the time, while regularly picking underdogs. The results are based on championships going back several decades – and across major sports including the NFL, MLB, NBA, NHL, and professional tennis and golf. The results for this article are based on every Super Bowl ever played, since the first Super Bowl in January 1967. Our very first “Who Will Win” the Super Bowl prediction — for the Wall St. Journal — correctly picked an underdog to win the big game. Will we pick an underdog again this year? Read more below! Big game experience and the related factor of confidence play a large role in winning. This is true in every major sport we have studied. Tom Brady and the New England Patriots take this championship factor, winning the Super Bowl last year — and two of the past three years. Tom Brady has shown a number of times that he can finish a game. Last year’s Super Bowl proved this when Brady and his team overcame a 28-3 game with only a little more than a quarter left. It is not a secret that the Patriots have the experience necessary to win yet another Super Bowl. Edge: New England. The old adage, “Defense wins championships,” has proven to be true. Defense is associated with hard-nosed, gritty work. Defense is typically more consistent – and interestingly, can overcome glitzy offenses - which are sometimes able to “run up numbers” against weaker opponents during the regular season. A large majority of Super Bowls (almost two-thirds!) has been won by the team with the better defense, measured by “points against.” The Eagles have one of the best defenses in the league this year. Edge: Philadelphia. Champions need to execute at a high-level, while minimizing errors and mistakes. The quarterback, as the team’s offensive leader, has a huge impact in determining championships. In particular, quarterback interceptions during the regular season are great predictors of Super Bowl success. The team with fewer interceptions during the regular season has gone on to win a majority of all Super Bowls. This has always been a strength of Tom Brady’s Patriots. Nick Foles has been playing well, but this quant fact edge goes to the Patriots. Edge: New England. Even with today’s powerful aerial NFL offenses, ball control remains one of the most important offensive indicators studied in both professional and college football. The team with the better running game, as measured by “average yards per rush,” has won a majority of all Super Bowls. The Eagles have three solid running backs to put the pressure on the Patriots. Recently, Jay Ajayi, has been dominant on the field, alongside LeGarrette Blount. The two athletes also have an impressive rookie to back them up: Corey Clement has made several key plays. Edge: Philadelphia. Similarly, stopping your opponent’s running game is related to winning the big game. The team with the better rushing defense has won almost 60% of the Super Bowls. The Eagles’ defense was successful against both the run and pass this year. With Fletcher Cox leading the Eagles defense, it should be interesting to see what the Patriots will answer with. Edge: Philadelphia. The championship factors favor the Eagles 3-2, so Philadelphia will be our official quant fact prediction. Note that we are once again picking an underdog: at the time of this article, New England is favored to beat the Eagles at Patriots -4.5. Side bar: Some readers may wonder if I have a bias since I went to college in the New England area — and live in the Philly area. However, I normally let the “numbers do the talking.” Enjoy the big game! Who Will Win the 2018 College Football Championship? Carlton Chin, a graduate of MIT, is a fund manager and quant researcher focused on portfolio strategy and sports analytics. An adjunct Professor at Rowan University, Carlton has worked with various sports organizations, including the Sacramento Kings— and has been quoted by the New York Times, the Wall Street Journal, and ESPN. Dr. Jay Granat, psychotherapist, named one of America’s Top 10 Mental Gurus by Golf Digest, has worked with Olympic athletes & sports organizations. A former university professor, he has authored several books on sport psychology — and has appeared on ESPN, CBS & Good Morning America. Kierstyn Koutsogiannis, a student at Rowan University, contributed reporting. Kierstyn is a marketing major, with a special interest in sports marketing. 2019 March Madness: Who Will Win the National Title? 2019 Final Four: Who Will Get to the Title Game?